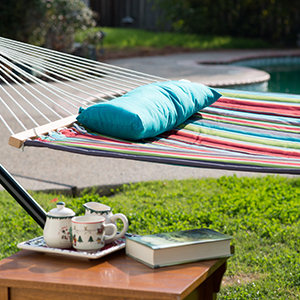 Hammock made from 2-Layer polyester fabric,With a beautiful varnished 55 inches hardwood spreader bar. Stand can be breaking down into 5 pieces easily and quickly for storage or for camping with it your trunk of your car. 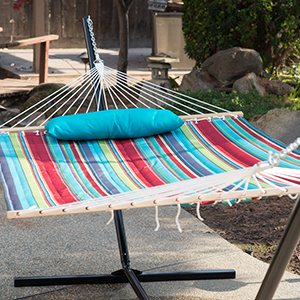 This fabric hanging hammock and stand combo is sure to bring comfort and style to your yard or patio!don't hesitate to take one to your garden or patio and make your resting or relaxing easier. This Quilted Hammock is made from UV resistant quilted fabric, it is not only soft and comfortable but also extremely durable. This hammock features its matched weather and fade resistant head pillow with polyethylene stuffing adding a new level of comfort to the hammock. The free standing hammock is made from a durable polyester material that is dye treated to make it UV-resistant. This hammock set includes a 15 foot heavy duty steel stand so all you have to do is assemble the stand and relax, and it is portable so you can move it in sun or shade, whatever you prefer! Love this! All of my friends want one too, I'm constantly sending out the link to it. Such a great price for this product too! So happy that i bought this one! This hammock is amazing. It was bought as a gift for my husband, but the whole family has used it. Very comfortable and relaxing. Easy to assemble I didn't even wait for my hubby to do it! Very comfy! Could spend all day in it! Perfect addition to our backyard! This was a complete impulse purchase but I'm so glad I bought it! Love laying in this and reading.